If you're planning a special event you will want to let the people you plan on inviting know as early as possible about the date of the event so they can "save the date" on their calendars. Save the Date cards are usually sent out a month or more in advance of the actual event. 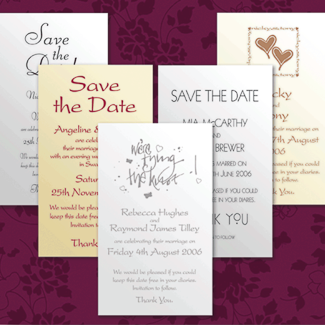 The cards will typically have a design in keeping with the actual invitation that will follow later. Save the Date cards can be anything from a post card to a greeting card or even a full blown brochure (when there are a lot of details to convey.) Your event is going to be an important event in your life or company and you want to make sure that the people you care about are going to be able to attend. Getting a Save the Date card printed and sent out to those people will help ensure that the people you care about share your special moments with you.